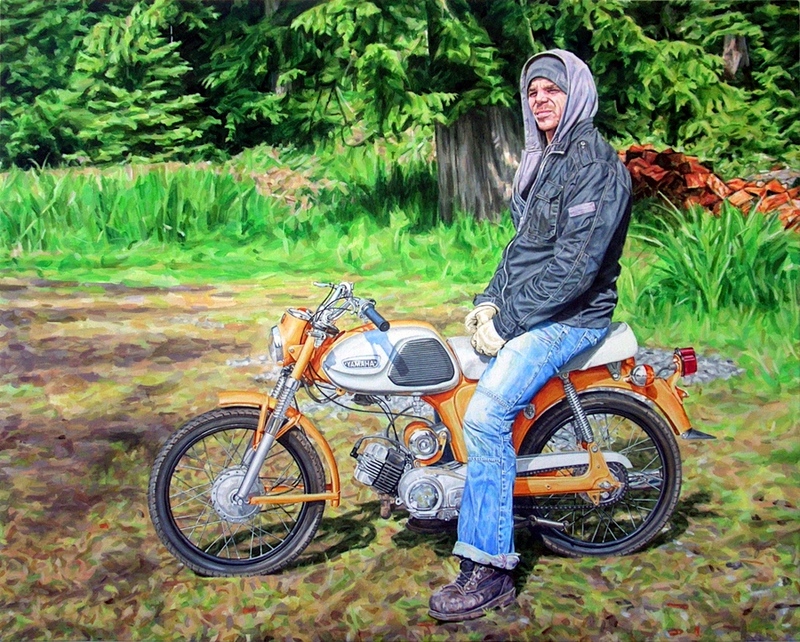 Another portrait of Neal, my studio mate, on his prized Yamaha YG1 café racer. Sadly it wasn't actually running at the time (although now is... sort of). I'm not the best at painting complex machinery, so this picture was a bit of a challenge. Motorcycle fans are very particular. This work was started at the very height of the growing season on British Columbia's Pender Island, so the foliage was a incredibly vibrant green. That said the photo is not the best, so appears far too lurid. I really must get a better camera. The film reference is hopefully obvious, and as in the movie, the bike (and as it's not operational) promises much, but is a transport to little but trouble.